Summer is almost here, although, as I start to write these notes, there is still some snow on the roof of my observatory (or, as my wife prefers to call it, the conservatory). So, it should be feeling warmer now and the Sun doesn’t set until gone half past eight. As soon as it has, following it into the sunset, there is Jupiter. Sunday the 12th will be very special because there will be a thin crescent Moon close by. During the course of the month, Jupiter is joined by another bright planet. This is Venus, the brightest of all the planets, although this year, it never rises very high in the sky. Using Jupiter as a guide, keep looking on a daily basis and you should soon spot Venus as they get closer together, until on the 28th they will be side by side. Then, as if to spoil their party, that minute menace Mercury pops up alongside from about the 22nd onwards. I must stress, however, that this all takes place very close to the horizon so you may need to find an elevated viewing position – I usually do. Over on the other side of the sky, meanwhile, another planet rises as Jupiter is setting. This is Saturn, over in the south east, easily visible as soon as the sky darkens. Notice it looks a bit more silvery than Jupiter. A nearly full Moon is close by on the 22nd and Saturn will be the highlight of the night sky throughout the summer (assuming we get one). Now, the Moon is close to Jupiter early in the month and as it tracks across the sky to join Saturn, it traces out a very special line across the sky. This is the ecliptic and it is where all the planets and the Sun are to be found – well nearly; the Moon and planets are usually a few degrees above or below. The constellations that the line passes through make up the Zodiac. At the moment, Jupiter is in Taurus, although not much of it can be seen. The next zodiacal constellation is Gemini and the two brightest stars, Castor and Pollux, are easily seen above and to the left of Jupiter. 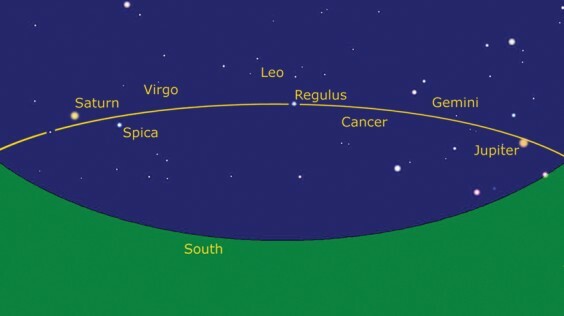 Leo is the next constellation that is easy to spot and its brightest star, Regulus, is sitting right on the ecliptic. Now, those of you who haven’t nodded off will notice that I have skipped Cancer, the Crab. It’s not as obvious but look halfway between Gemini and Leo and you should see a faint inverted ‘Y’ of stars. You may have to wait until gone ten o’clock and squint a bit but it is there, with the central star sitting on our imaginary line. After Leo comes Virgo which is very easy to find at the moment, because Saturn is sitting in it. Below Leo and to the left are two bright stars, looking like a pair of eyes peeping at us over the horizon. The left one is actually the planet Saturn and to the right is Spica, the brightest star of Virgo. Stretching up towards Leo from Spica is a faint Y shape which is one half of Virgo, and the other half forms a vague box shape above Saturn but this side is trickier to see. So, by scanning across the sky from Jupiter, through Regulus and on through Saturn, you can almost see the ecliptic, like a line drawn across the heavens. As usual with my notes, you will have to use a little imagination!